Italy is known for its coffee, and rightly so. I don’t know what the secret is, but I suspect it’s something in the water, the atmosphere, or possibly the technique involved in ordering and drinking it because try as I might, I cannot replicate the perfect espresso experience anywhere else. Follow these simple guidelines and you too can discover the joy of drinking coffee in Italy. At precisely 11 a.m. rush to the nearest bar, the narrower the better. Elbow your way to the counter and stand. Don’t sit at the inviting café tables nearby. You will pay double or worse for your coffee, and plus, sitting is for tourists, the elderly, and the infirm, and you are none of these - you are an espresso drinker. Order a coffee (Un caffè, per favore?). This means espresso in Italian. It will be short, strong, black, and quick on the draw. Maybe you’d prefer your espresso macchiato, that is to say, with a dash of milk. The milk can be hot, cold, with foam or without. 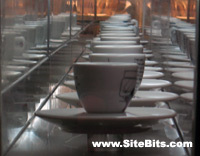 You can also choose between drinking your coffee in a glass cup (“in vetro”) or a ceramic cup (“una tazzina”). Be very specific about what you want, and act as though you care deeply about it. Stir in a packet of sugar and be sure to tap your spoon a few times against the edge of the cup. Light a cigarette (or rather, imagine this part, since smoking is no longer permitted indoors in Italy). Ash on the floor (again, imaginary). Make conversation with the barista if he’s not too busy but remember this: conversation is merely a vehicle for caffeine. Feel your eyes begin to open. Listen to Giovanni describe what he had for dinner last night, and an old man muttering to no one in particular about the strengths and weaknesses of Milan’s new goalie. Hear the slam-SLAM of espresso grounds being deposited in the trashcan, the hiss of the milk steamer, and the tink of many tiny spoons in many tiny cups. Order another coffee. Smoke another cigarette. Taste the tobacco notes blending with the mellow bitterness of the espresso. Feel your heart racing. Pay in exact change, wave goodbye to the barkeep and hop on your Vespa. No, the traffic is not moving especially slow today, you’ve just had a run-in with Italian coffee. Now that you know the DOs, it’s time for a few DON’Ts. And don’t order an “Americano” even though it’s on the menu. The espresso in Italy might be strong (actually, I’ve heard that the process creates a beverage with less caffeine than a cup of drip coffee) but it’s not as bitter as you might imagine so try it at least once. If you feel your heart skip more than a few beats, you could switch to cappuccino (a drink you know well. but NOTE: if you want to sound really Italian, call it a “cappuccio” instead) or a “latte macchiato” (steamed milk with a dash of espresso - best described as a weak café-au-lait) or even “una tisana” (herbal tea). The price of a coffee in Italy: Regulated city by city, ranging from about 1€ in the north to 75¢ in the south. Drinking your coffee like an Italian: Priceless.